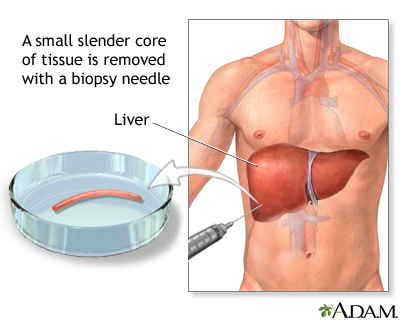 A liver biopsy is not a routine procedure, but is performed when it is necessary to determine the presence of liver disease and to look for malignancy, cysts, parasites, or other pathology. The actual procedure is only slightly uncomfortable. Most of the discomfort arises from being required to lie still for several hours afterwards to prevent bleeding from the biopsy site. Updated by: Richard LoCicero, MD, private practice specializing in hematology and medical oncology, Longstreet Cancer Center, Gainesville, GA. Review provided by VeriMed Healthcare Network. Also reviewed by David Zieve, MD, MHA, Medical Director, Brenda Conaway, Editorial Director, and the A.D.A.M. Editorial team.